According to the WB’s Taking Stock report, released in Hanoi on June 14, the Vietnamese economic growth has been robust in recent time, accompanied by broad macroeconomic stability. Speaking at the launch ceremony, Ousmane Dione, WB Country Director for Vietnam, said the country’s impressive economic growth in 2017 and the first quarter of 2018 gives the country a firm foundation to move forward. This is a great opportunity to invest in human resources, thereby addressing challenges to maintain growth momentum, he said, stressing that the WB is willing to help Vietnam achieve sustainable and long-term growth targets. Introducing the report’s main contents, Sebastian Eckardt, lead economist of the WB in Vietnam, said current favourable economic conditions such as high growth and low inflation offer Vietnam a special chance to boost reform. Prudent macroeconomic policies should be parallel with profound and comprehensive structural reforms, including reform of regulations to remove barriers and reduce operational costs for the private sector, invest in high-quality human resources and infrastructure, and increase productivity of State-owned enterprises, he said. 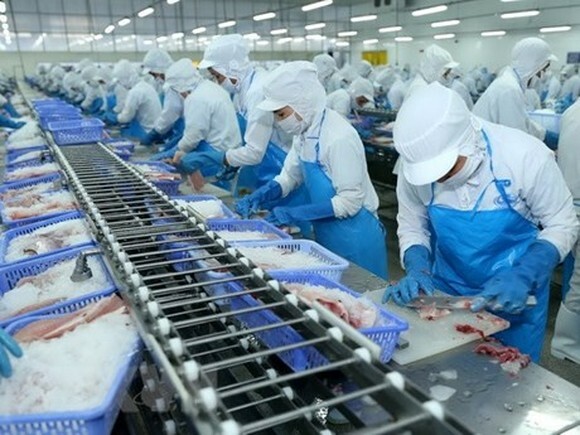 According to the report, Vietnam’s trade balance continued to improve owning to strong trade performance and FDI inflows, contributing to the overall current account surplus, estimated at 6.8 percent of GDP in Q1 2018. The exchange rate has been relatively stable while reserves continued to rise, reaching 63 billion USD in the first four months of this year, equal to around 3.6 months of imports. Against the backdrop of low inflation, monetary policy remains accommodative. Vietnam’s consumer price index has been ticking up slightly at 2.8 percent (year on year) in the April 2018, driven by electricity and health services price hikes. Rapid credit growth and abundant liquidity could worsen volatility in Vietnam's financial markets, especially against the anticipated tightening of global monetary conditions. Public debt has stabilised since 2017, with an overall fiscal deficit of 4.5 percent of GDP, and the public-debt-to-GDP ratio declined to 61.4 percent in 2017 from 63.6 percent in 2016, said the World Bank. The report said despite improved short term prospects, risks remain significant. Domestically, slower progress in restructuring state-owned enterprises and banking sectors could adversely impact the macro-financial situation, undermine growth prospects, and create large public-sector liabilities. External risks include escalating trade protectionism, heightened geopolitical tensions and faster-than-expected monetary tightening which could lead to disorderly financial market movements. The report’s special section looks at reform priorities for reducing trade costs and enhancing competitiveness in Vietnam. While Vietnam has made great progress in reducing tariffs, there remains significant potential to reduce trade cost through rationalization of non-tariff measures or specialized controls, more efficient border management and logistics.